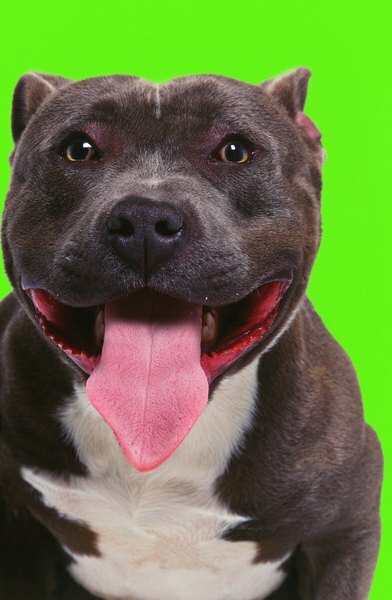 Help your pit recover his glossy coat with immediate treatment of mange. Mange is an excruciating skin disease caused by external microscopic parasites. Any breed of dog can get mange, but it's more likely to occur in strays and dogs that spend time outdoors with at-risk dogs. Pit bulls are no more or less susceptible to mange than other dogs. There are two basic types of mange. Demodectic mange, or “red mange,” is the most common type of mange, affecting larger patches of your dog’s skin. If not treated in a speedy manner, a secondary infection can occur, resulting in an unpleasant odor of the skin and intense itching. Sarcoptic mange, or “canine scabies,” is highly contagious. It can leave lesions on your pooch’s ears, legs, elbows, and chest. Secondary bacterial infections and yeast infections are also possible if left untreated. If your beloved pit bull is just a puppy, he is at an increased risk of developing mange, especially if he's less than 18 months of age. Demodetic mange is caused by the Demodex canis parasite that resides in the pit bull's hair follicles. According to the Michigan Avenue Animal Hospital, all dogs have a few of these mites that live on their skin; when the immune system is disfunctioning or immature, they can quickly reproduce. Demodectic manage is not contagious, and Demodex mites are typically transmitted to pit puppies from their mothers soon after birth. Sarcoptic mange is caused by the Sarcoptes scabei parasite and is highly contagious. While it is usually spread from infected dog to dog by direct contact, sarcoptic mange can also spread by contact with an infected object that an infected dog used, such as a blanket or bed. Sarcoptic mange is more common in areas with many dogs that is not well-maintained, such as crowded kennels, animal shelters or pet shops, or in rural environments where strays congregate. Mother dogs can transmit this parasite to their puppies, and dogs can obtain these pestering parasites at grooming salons through unsantized equipment. Mange is often highly visible in pit bulls, as their short coats make bald spots, scabs and sores more noticeable than they'd be on longer coats. If you pittie has demodectic mange, you may notice hair loss due to the itchy and uncomfortable disease -- dogs are known to scratch themselves bloody trying to relieve the itching caused by mange -- and crusty skin. Often mange appears first on the tips of the ear flaps. Demodectic pododermatitis is a form of mange confined to just your pit's foot. It is often accompanied by bacterial infections. Sarcoptic mange can cause extreme itchiness, resulting in intense scratching and restlessness as your pooch tries to relieve his discomfort. Symptoms generally appear about one week after exposure and from there can rapidly spread over the body. When the mange is only in certain areas, such as around the eyes, the condition is considered localized. As it spreads to other areas of your pooch’s body, it becomes generalized. If your no-longer-playful pit is suffering from mange, seek treatment immediately before it spreads. Treatment will ultimately depend on the type of mange your pittie has. Localized demodectic mange is generally treated with a topical medication. For more aggressive cases of mange, oral medications or medicated shampoos may be required to treat secondary infections. In most cases, your vet will prescribe lvermectin to help treat your pit's mange. Since sarcoptic mange is contagious, it’s important to isolate your pit to prevent the condition from spreading to other pets and humans in the household. Your vet may prescribe anti-parasitic medications, as well as medicine to relieve itching, inflammation and any secondary infections that your precious pit may be dealing with. In most cases, your pit bull will recover just fine from mange, although generalized demodicosis may take longer to treat. In the meantime, it’s important to educate yourself on mange to prevent a reoccurrence of the maddening mites. Before allowing your pit to rejoin the family, clean or replace all of his bedding, toys or anything that could have been infected. Check other animals in the home that could have come in contact with your pit bull, and treat if necessary. Your vet may schedule routine visits to recheck your pit’s mange problem and make sure that all mites have been eliminated.